Just discovered this report: BEACON eSpace at Jet Propulsion Laboratory: Genetic inventory task final report. 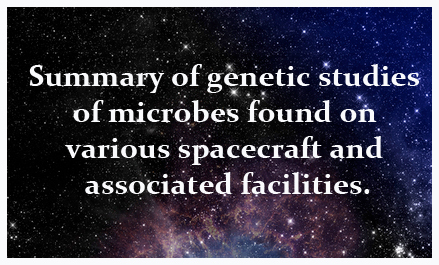 It is a summary of genetic studies of microbes found on various spacecraft and associated facilities. Contaminant terrestrial microbiota could profoundly impact the scientific integrity of extraterrestrial life-detection experiments. It is therefore important to know what organisms persist on spacecraft surfaces so that their presence can be eliminated or discriminated from authentic extraterrestrial biosignatures. Although there is a growing understanding of the biodiversity associated with spacecraft and cleanroom surfaces, it remains challenging to assess the risk of these microbes confounding life-detection or sample-return experiments. A key challenge is to provide a comprehensive inventory of microbes present on spacecraft surfaces. To assess the phylogenetic breadth of microorganisms on spacecraft and associated surfaces, the Genetic Inventory team used three technologies: conventional cloning techniques, PhyloChip DNA microarrays, and 454 tag-encoded pyrosequencing, together with a methodology to systematically collect, process, and archive nucleic acids. These three analysis methods yielded considerably different results: Traditional approaches provided the least comprehensive assessment of microbial diversity, while PhyloChip and pyrosequencing illuminated more diverse microbial populations. The overall results stress the importance of selecting sample collection and processing approaches based on the desired target and required level of detection. The DNA archive generated in this study can be made available to future researchers as genetic-inventory-oriented technologies further mature. I am just starting to dig through it but certainly seems of interest to microBEnet activities such as Project MERCCURI.